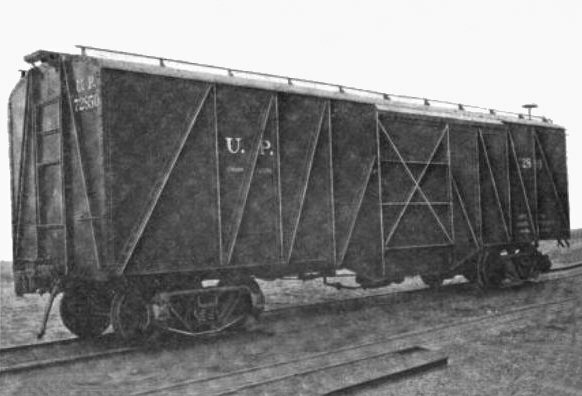 McKeen All-Steel Boxcars | The McKeen Motor Car Website McKeen All-Steel Boxcars | The Compendium of Knowledge on the McKeen Motor Car Company, and their experiments. McKeen all steel boxcar 72850. 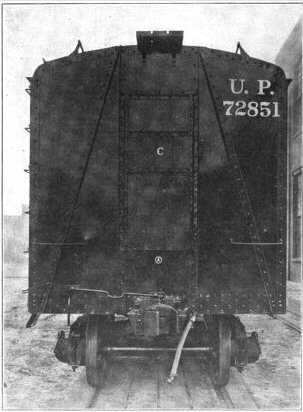 Steel Box Car for the U. P.
The Union Pacific railroad, of which Mr. W. R. McKeen, Jr., Is superintendent of motive power and machinery, and have recently turned out of their own shops, at Omaha, Neb., Two styles of boxcars built entirely of steel. Looking at are illustrations it will be seen that one of these cars is made up of side sills having a short form of trust construction, while the other has a long form trust construction on the outside sills. 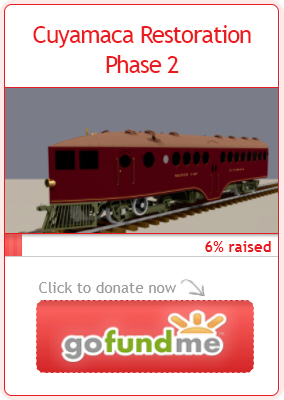 The short truss rod car, number 72850, is 40 long inside, 8 feet 10 1/2 inches wide inside, and the inside height to the top of the curved roof is 7 foot 10 inches. A short trust car has a center door each feet wide, and the sides are made with four panels on each side of the door stiffened with tee irons, 4 by 2 by 15 counter braced with angles 3 1/2 by 2 1/2 by 3/8 inches., To which are riveted the bottom of the side plates. The side construction is therefore of the bridge type, and in fact the whole car may in a sense be called a modification of the box girder which was used in some of the earlier forms of railway bridges. 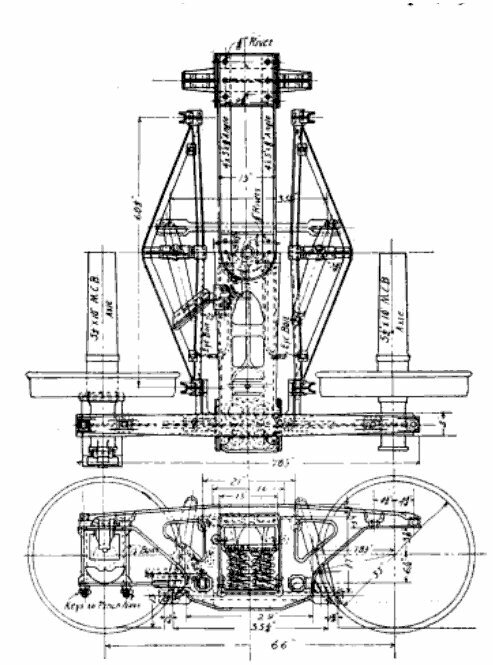 The bracing of the under frame is designed so as to give great stiffness longitudinally, which enables the car to resist buffing and polling shocks to which it is subjected. These braces run from center still to the side sills in a diagonal direction, and are angles five by 3 1/2 by 5 inches. The center outside sills are also bound together by angles on the tie rods at right angles to the sills, and the needle beams are composed of channels. The roof is practically semi-elliptical and is supported by 2 1/2 inch angles spaced 2 feet apart. These angles are the carlines of this roof. 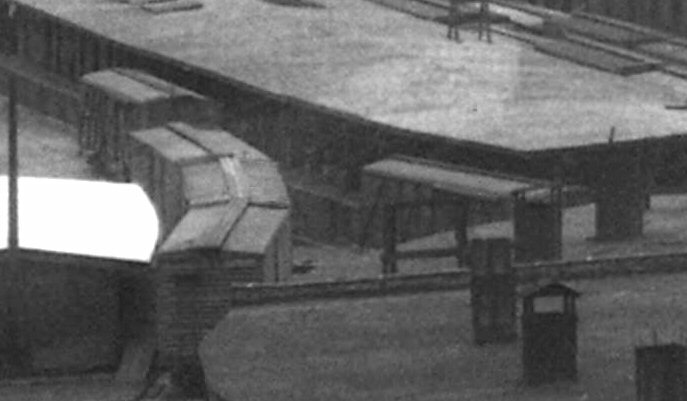 The curved roof has a pair of handrails running along the top on each side, each rail being 3 ft. from the center of the car. The body-bolsters of cast steel made in two pieces secured to the center sill by top and bottom cover plates. The center brace for the two panels next to the door is approximately of arch construction. The base of this brace runs down on to the others, encroaches slightly upon the open space of the door at the top, runs along on the top plate of the car and down through the other panel in similar style. If the center sill of the car, for there is only one, is an I-beam, 15 inches deep and weighing 42 pounds per foot. The center sill extends beyond the center of the body bolster, a distance of 17 inches. Extension of the center sill from this point is made of two channels and weighing 20 1/2 pounds to the foot. These are spaced 12 7/8 inches apart in concert to draw sills in which the sessions drive gear is carried. The side sills are angles 5 by 3 by 5-16. The weight of this style of car is 37,750 pounds. Its volume is 2,800 Cu. Ft. The capacity of the car is 100,000 pounds. A car with long trust arrangement is number 72851, is made up of five panels on each side of the door which is 6 feet wide. The panels on each side of the door are 2’9¾ inches wide, and are made of upright tees, 4 by 2 by 5-16 inches so. The end panels extend from the body-bolsters to the end of the car and have each of the one angle counter brace 3½ by 2 ½ and 3/8 inches. 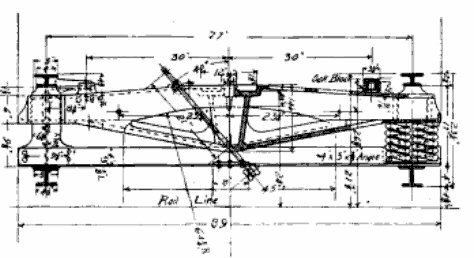 The diagonal bracing of this car frame consists a pair of angles 2 1/2 by 2 1/2 by 3-5 inches., Placed back to back and laid on the inside of the flange of the tees. 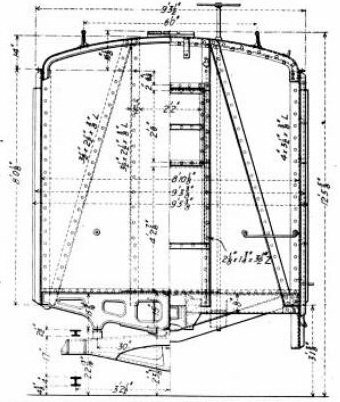 At the intersection of the diagonal brace of the upright tees are quarter inch plates which add considerably to the stiffness of the frame. The upper angle of the long diagonal brace carried over the door in a similar manner to that of the other car. 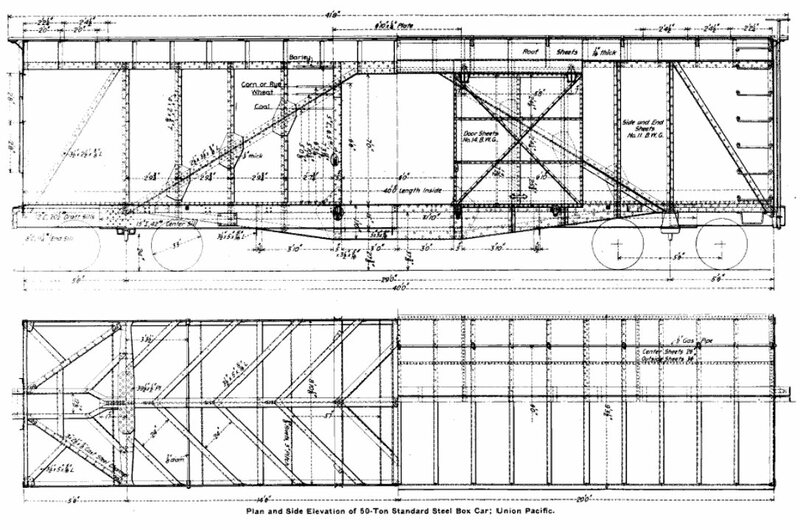 The side bracing of this car between the body-bolsters consist of the truss side sill in the diagonal braces which passes over the door, forms in a sense, a double arch. The two designs of the cars are very much alike. The Lightweight of this last mention of car is 38,050. It has a volume of 2,800 cubic feet and has a capacity of 100,000 pounds. If cars are made of number 15. B.W.G. plate. The stability of each car is therefore dependent on the bracing, though the side sheets lend a certain amount of stiffness to the whole construction. The roof is made out of I-16 steel inch plates. The floor plates are no 10 B. W. G., and the running boards are of wood. The designs wee prepared under Mr. McKeen, to whom we are indebted for photographs and prints. The object of building these cars were to test the merits of the two methods of construction. The bridge truss and the plate girder when applied to the modern steel car construction is generally found associated with structural steel shapes, and these cars seem to combine few parts yet make a strong and stiff form of vehicle. the cars are, of course, fireproof and should prove very serviceable in heavy and hard service.